Sailing out to the islands on a cloudy day was nice. After squashing what we thought were all of our obstacles to getting out to the islands near La Paz for a more relaxing “vacation” part of our trip, we set sail on a cloudy day. It was a nice sail slightly upwind, so we planned to sail out on one tack and motor back into anchor, as we were feeling lazy and didn’t want to sail upwind the whole way. 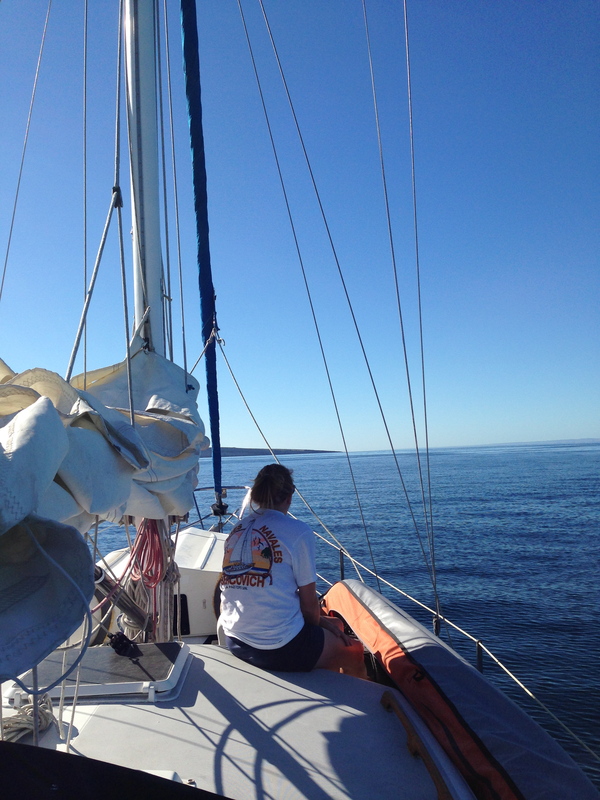 Sails up and heading out to Isla Espiritu Santo. After motoring for maybe 30 minutes, our engine began overheating and spewing coolant. We immediately killed the engine and began sailing toward the nearest anchorage, unsure what the issue was. 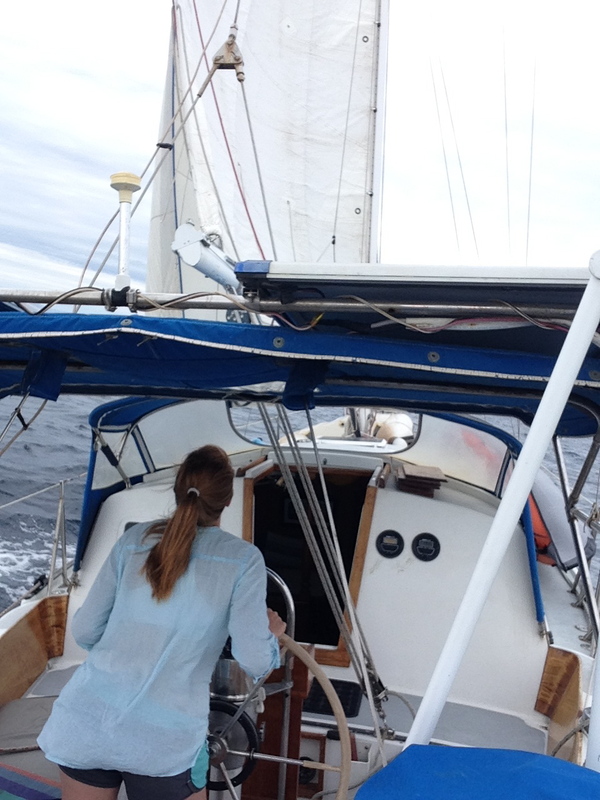 We sailed upwind in light winds all the way to anchor in Bahia San Gabriel. The engine had finally cooled enough for Tim to get in and take a look. It turned out to be an easy fix of installing a new alternator belt, allowing us to motor up to a safer anchorage with more wind protection just before one of the more beautiful sunsets. Our alternator belt broke and our engine overheated on our way to the islands. Tim had to dive into the cockpit locker to fix it. 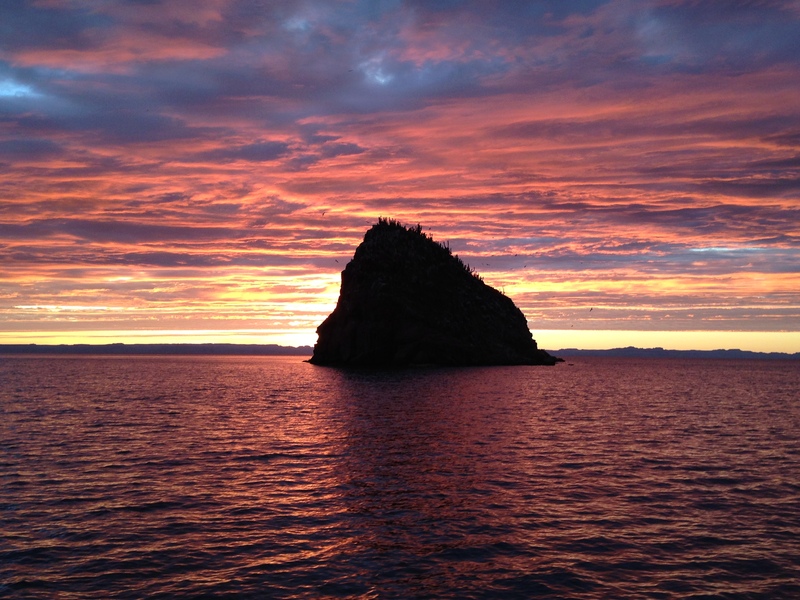 We arrived to anchor just before sunset at Isla Espiritu Santo. 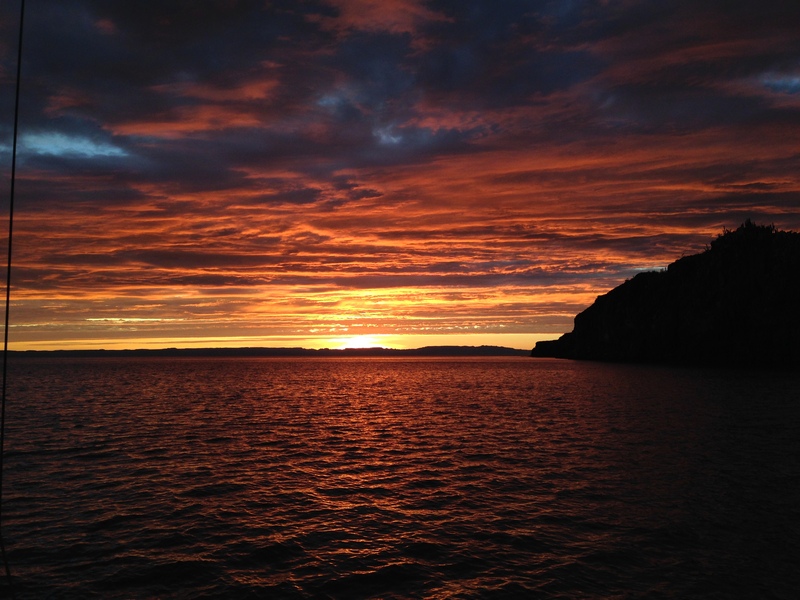 It was a stunning sunset as we anchored for the night. The next day offered winds from the west/southwest, allowing for us to have a wonderful sail up to one of my favorite islands — Isla San Francisco. 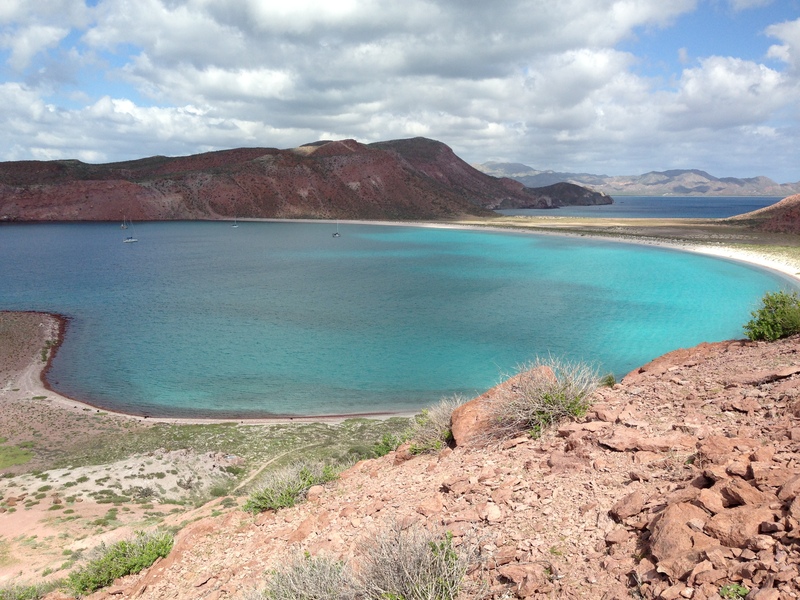 This is one of the more picturesque places we have visited in the Sea of Cortez. The same night, our friends on s/v Calypso, Rick and Jasna, arrived just before sunset. We had planned to meet them there, but weren’t sure if the would make it. We enjoyed swimming, kayaking, spear fishing (Tim, Rick and Jasna) and hiking at the island for six days. Rick and Jasna had to deliver some school supplies to the small fishing village just to the north, San Evaristo, and we were looking to get away from the tons of mosquitos at Isla San Francisco, so we followed them upwind. Our nice sail up to Isla San Francisco. We were keeping the sun off our backs as we sailed north. 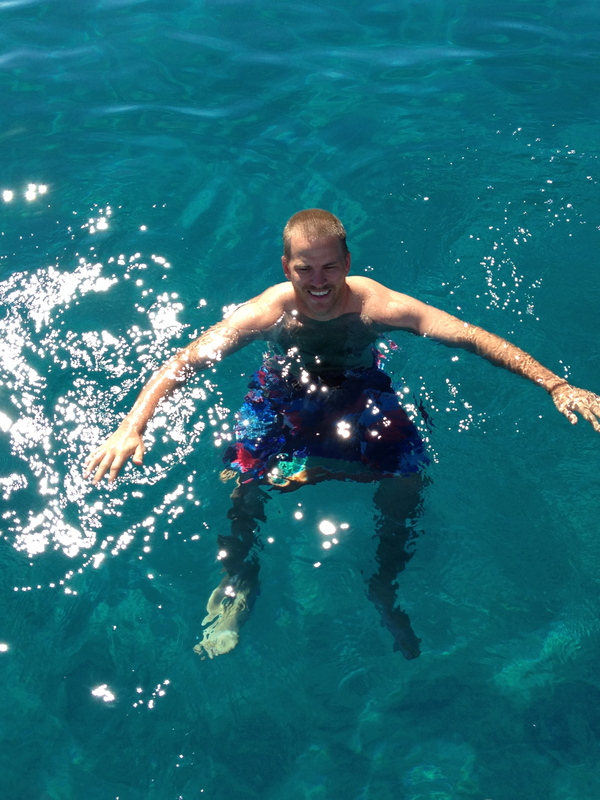 The water was crazy clear and the perfect temp for swimming. 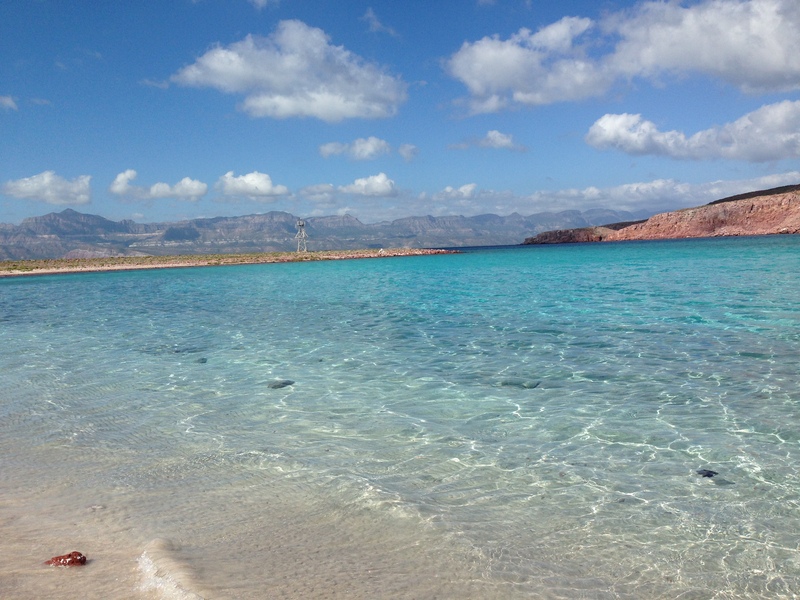 Swimming, fishing, kayaking and hiking at Isla San Francisco. 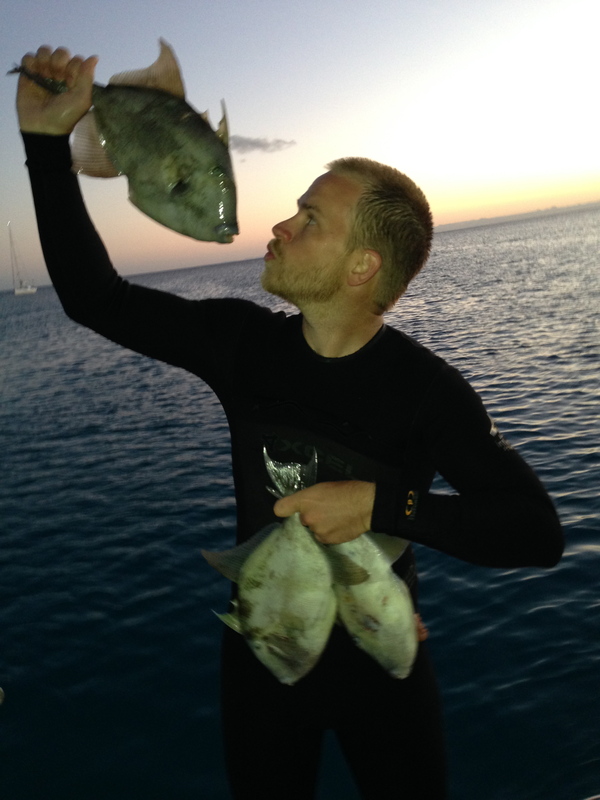 Tim shot three trigger fish for dinner with Calypso. Beautiful Isla San Francisco from the hike along the ridge line. Me and Tim hiking with Jasna along the Isla San Francisco ridge line. 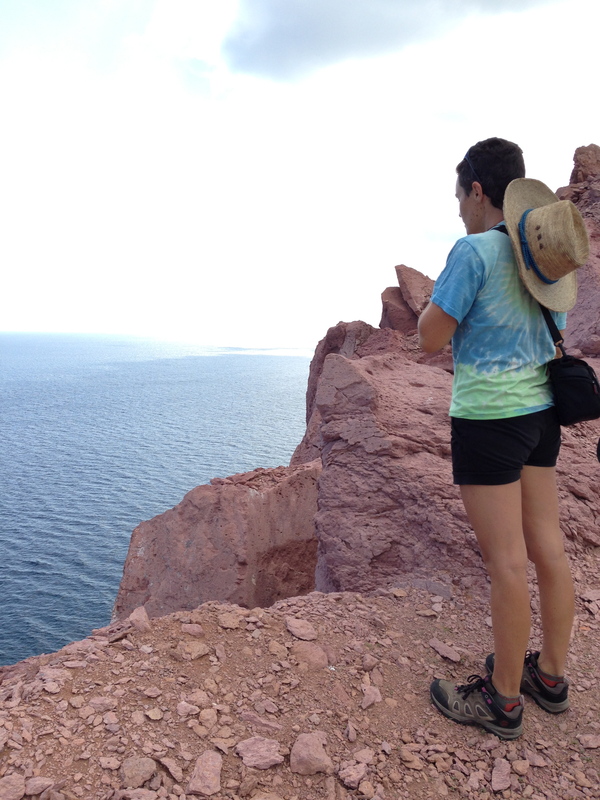 Jasna gazing off into the Sea of Cortez on our hike at Isla San Francisco. 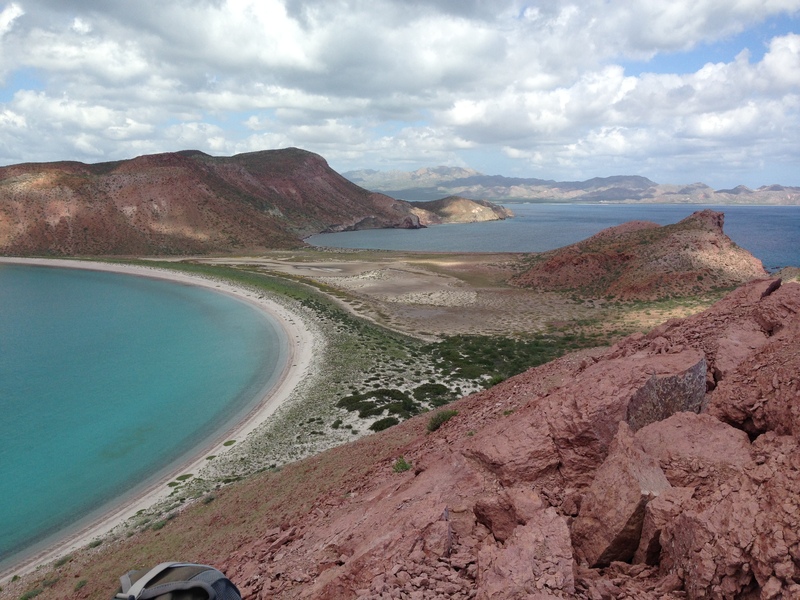 The view from the top – Isla San Francisco. Jasna and Rick on Calypso are expert sailors, I would say. Jasna used to teach sailing in Italy, and Rick took a Yatchmaster course in Austrailia. Knowing we could learn a thing or two from these pros, we set out to follow them on our next sail upwind to San Evaristo. This proved a bit unsuccessful as we tried to tack our way to the little fishing village, we got frustrated and decided to turn the motor on (cheaters, I know). Much to our dismay, the alternator belt was slipping and our engine was struggling with overheating again. Tim rigged up a temporary solution by tying a line to the alternator and putting upward pressure on it so we could motor sail our way in. We stayed for a couple nights in San Evaristo, restocking our chocolate stash and a few other fresh foods that were running low. 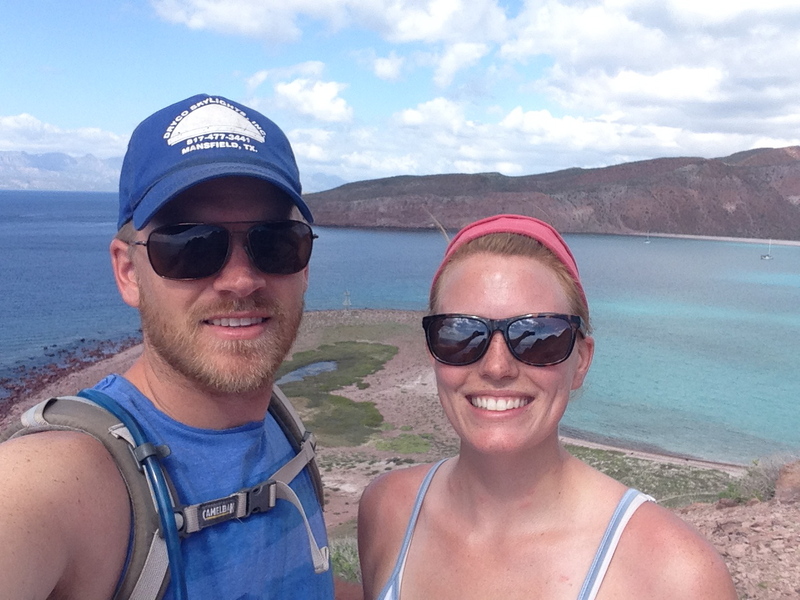 With north winds predicted for the next several days, we all decided it was a good time to head back to La Paz. We were a bit nervous, considering our motor troubles, but left early for what we thought would be a nice downwind sail. Unfortunately, just as we pulled out of the anchorage, our engine was overheating again and the belt had broken once more. Frustrated, we opened our jib only and headed downwind, thinking we could repair it along the 6 hour trip. 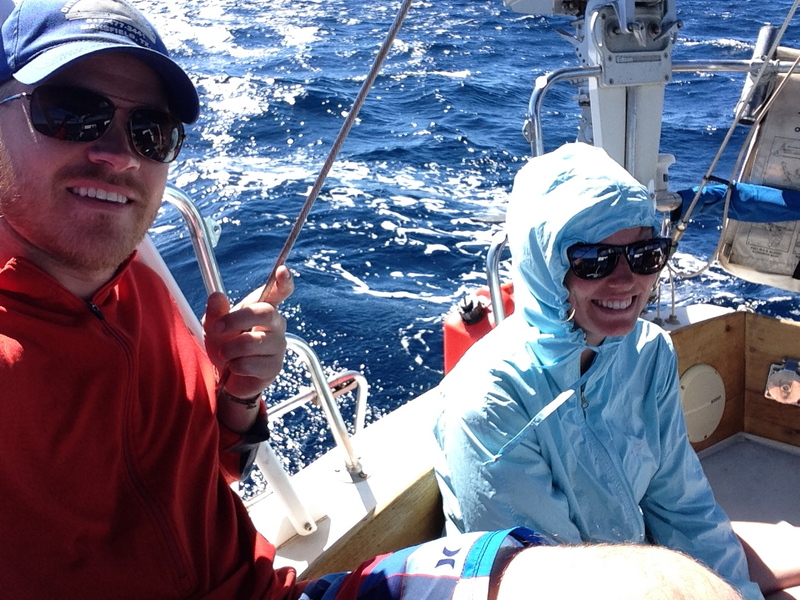 The sea was pretty rough and choppy, and without our main sail up, we were rocking and rolling the entire trip. This didn’t give Tim a chance to crawl around the engine compartment and sort out our issue. 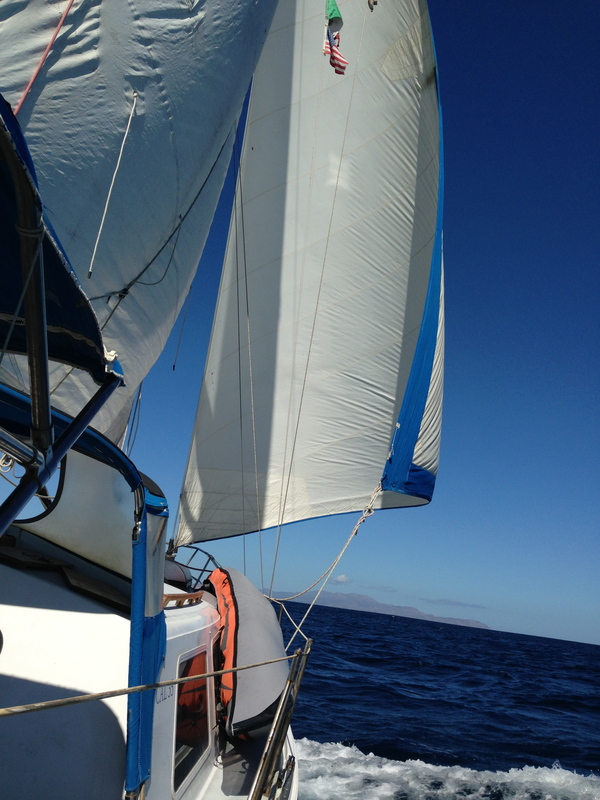 The wind was getting pretty strong as we and Calypso — both with only headsails out — headed down to Isla Partida. As we finally approached our intended anchorage, we attempted turning into the wind with hopes of getting close enough to safely to drop anchor. This was a big mistake. 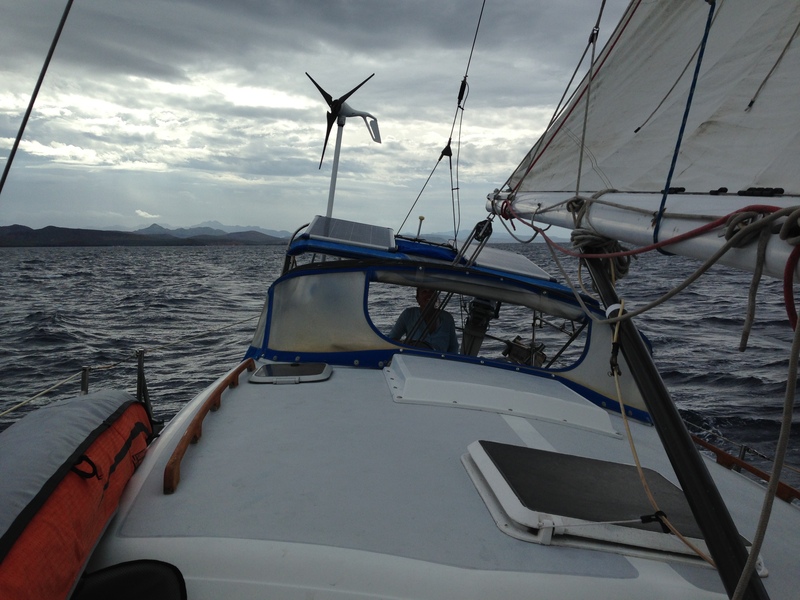 The wind had picked up over 20 knots and we didn’t have any power without our main sail up. So we raised the main with the boat pointing downwind — a little dangerous maneuver because the chances for a accidental jibe are high. That is exactly what happened. We accidentally jibed hard, popping the boom right off the mast. I had already reached my maximum stress load and freaked out about 10 minutes before we lost the boom. So, I stayed strangely calm, sailing the boat into the mouth of a different, calmer anchorage where Tim was able to replace the alternator belt before we got too close to land. 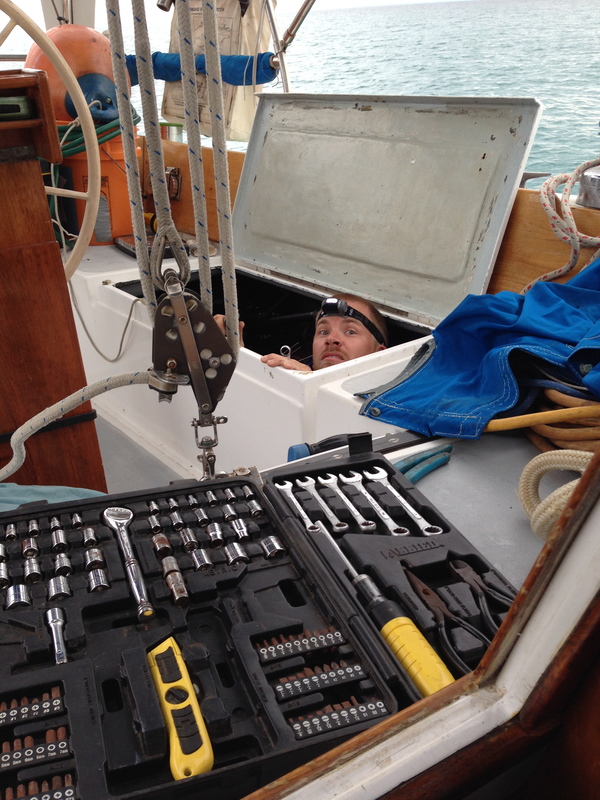 This allowed us to motor (hobble) the rest of the way to anchor. After a day like that, there was no way we could come on the VHF radio and hail with the name “Luckiest.” We decided at that moment we must rename our boat. We called Calypso, who had already anchored in our intended spot. They came down right away to help us lick our wounds. We were happy to have their help, and we all stayed a couple of days to relax. The second night we had our renaming ceremony (sailor’s tradition) for our boat, asking Neptune to take care of her under the new name — Lucí. It was a calm, wind-free day as we motored back to La Paz after reattaching the boom and repairing the engine a final time.